Well, that was fast. Do-it-yourself electronics kit maker and hobby retailer Adafruit recently announced that a hacker had won the company's Open Kinect Bounty. Spain-based hacker Hector Martin Cantero, who is known online as "marcan," released a proof-of-concept video Wednesday night showing the Kinect interfacing with his Linux-based laptop. As the official winner of Adafruit's OK Bounty, Marcan was awarded $3000 (the bounty has been upped twice from the original $1000). The OK Bounty was a competition to see who could create the first open source software drivers for Kinect, the Xbox 360's motion-control device. Marcan uploaded his code and it is now available for anyone to access, here. It should be noted that unless you're a programmer there's probably not much you'll be able to do with this code. Besides awarding Marcan the $3000 bounty, Adafruit also donated an additional $2000 to the Electronic Frontier Foundation. The donation acknowledges the EFF's work in defending hackers from corporate lawsuits. Earlier, Microsoft had said it would work with law enforcement to protect the Kinect from hackers. Adafruit said that if Microsoft ever did go after the retailer or Marcan that the EFF would most likely be its only hope for a proper legal defense in court. In the video above posted to YouTube, Marcan said he was able to get his hack to work just three hours after the Kinect's European launch on November 10. 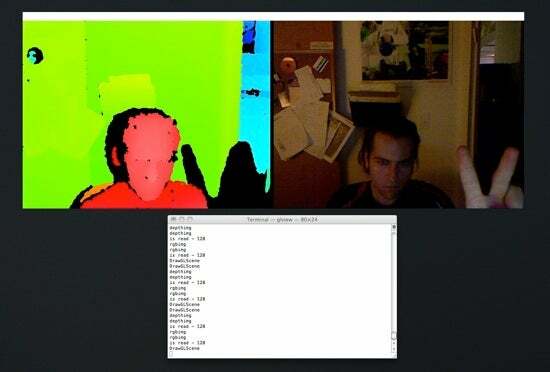 Marcan's hack isn't much to write home about, all he was able to do was get the Kinect's RGB camera and depth perception to display on his laptop's screen. "It's a complete hack right now, but I believe this proves the concept," Marcan said. Since Marcan's hack, others have forwarded their own open source drivers for the Kinect. You can see a video of Vimeo user Theo Watson replicating Marcan's results using the Kinect on a Mac OS X machine here--Adafruit's experiments with Watson's hack pictured above. The hack uses Marcan's code plus some of Flomuc's on work on multitouch interfaces. Now that the Kinect hack is out of the bag, the software development frenzy has begun in earnest. Blogger Matt Cutts--whose day job is the head of Google's Web spam team--is personally offering two $1000 prizes to spur open source innovation for Kinect. The first prize is for anyone who creates an open source " app, demo, or program" that uses Kinect. The second $1000 prize will go to the hacker that "does the most to make it easy" for others to write Linux programs that use Kinect. Basically, Cutts is looking for someone to help create a rudimentary development platform for Kinect on Linux. It should be noted that Cutts is offering this prize money on his own, this is not a contest directly funded by Google. There is also an OpenKinect forum on Google Groups discussing various experiments with Kinect including creating a 3D scanner and augmented reality applications. The group had over 400 members at the time of this writing. It will be interesting to see how Microsoft deals with the hacking craze spurred by its new motion-control device. On the one hand, it may be annoying to find people using Kinect on Linux, Mac OS X and Windows PCs instead of the Xbox 360. But if the Kinect hackers produce some amazingly cool results that others can then use at home, Microsoft would be far better off encouraging the hackers projects. This would spur even wider use of Kinect, and how could that be a bad thing for Microsoft?